Tuvan Drama theatre is performing these days in Krasnoyarsk where the 'Siberian Transit' Theatre Festival takes place. The Tuvan company presents its interpretation of the Shakespeare's 'King Lear' with Alexandr Salchak in the main role. As the Krasnoyarsk media reports this performance was followed by a quarter of an hour's ovation. Kyzyl Khural of local deputies adopted unanimously a new statute of the Tuvan capital in accordance with which instead of the single post of the Kyzyl mayor there will be introduced two - a position of Head of the City elected out of the deputies of the Kyzyl khural by the deputies themselves and that of Chairman of the alexistration – professional manager - appointed by a special commission and executing his duties on the basis of the contract. Tuvan female wrestlers have come third among women teams in the All-Russian Sumo Championship which has just finished in Moscow. Junior Zhanna Saaia (under 70 kg) won a gold medal, Alina Shoidan – 2 bronze ones: in the weight category under 80 kg and in the absolute category. Male wrestlers from Tuva occupied the whole piedestal in the under 85 kg: Kan-Demir Kuular taking the first place, Kenden Kara-Kat – 2nd, Alexei Mongush -3d. 25 masters from 6 districts and the city of Kyzyl competed for the tittle of the Best Maker of Tuvan traditional musical instruments submitting to the jury headed by music expert Valentina Suzikei 105 musical instruments – igil, byzaanchy, chadagan, doshpuluur, chanzy, khomus, kengirge, dungur, limbi, shoor, ediske, murgul. In the first round the judges estimated the acoustic parametres of the instruments listening to their sound from behind the curtain to mainain anonimity. In the second round the masters should have acquainted the jury with their personal methods, materials, secrets. Aldar Damdyn, teacher at the Kyzyl Art School, musician in the Tuvan Traditional Instruments Orchestra, was recognized the Best One. Sergei Shoigu, federal minister for Emergency and Civil Defence, is celebrating his 50th jubileum. Born in the city of Chadan in a family of the party leader Sergei has always striven to avoid the status of the son of the influential person. That is why after leaving school he went to Krasnoyarsk where the name of his father Kuzhuget Shoigu meant nothing. He made a splendid carreer in the construction business there and when Boris Yeltsin being 'repressed' after the Party Congress came to head the State Construction Committee in late 80-ties he invited the young man to be his assistant. 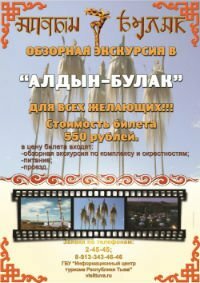 The Ene-Sai song company will perform at the Moscow-based All-Russia Museum of Decorative, Applied and Folk Arts, May 24, announces the www.museum.ru website. The company will offer samples of unique guttural singing. This inimitable vocal music, locally termed "hoomei", is the most expressive and memorable part of folk culture in Tuva, in Siberia's south. Three Mongolian border guards, who deserted their unit and killed two servicemen last week, were detained in Tuva (Russia) and are facing criminal charges, spokesman of Tuva regional prosecutor Vasily Krivdik told Tass on Friday. The direct Moscow-Kyzyl-Moscow flight after almost half a year interval will be renewed, confirmed Sergey Lipovoi, Interavia Director General, in an interview to Tuva-Online. Interavia has bought the Astair company which has made this air communication since August, 2001. The Astair went bankrupt. The declared debts of the company after the deal turned out to be even bigger, what complicated the situation thus postponing the renewal of the flight on a rented Yak-42 till June,1, confessed Mr Lipovoi. 'Ene-Say' and 'Olchei' Tuvan folk-ensembles will perform today in the Kremlin Palace of Congresses. They will make there part of the 'Club Music' concert. This project was initiated by Valeri Samsonov and Vitali Rosenberg who in an interview to 'Tuva-Online' said that in contrast to pop-music of low quality which is now widely-spread all over in Russia they want to make public at large get to know the 'really good music of all times and peoples'. The results of the second round of the elections into the Legislative Chamber of the Great Khural held in the Bai-Taiga and Mongun-Taiga districts are declared valid by the Tuvan Elections Commission with the turnout surpassing 50 per cent envisaged by the law. In mountaineous Mongun-Taiga Kheimer-ool Kuular is in the lead with 48 per cent of votes, Mart-ool Kunchu is a runner-up with 44.